Four decomposed bodies left behind in a recently sold funeral home were "definitely not" the responsibility of the business' former director, the man said Wednesday. "Definitely not. Definitely not. 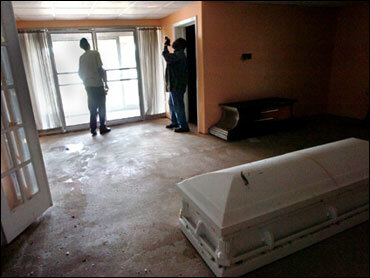 I'm almost positive," said Darryl Cammack, the owner of the defunct Serenity Gardens Funeral Home in Gary. "I'm sure they're not." The bodies were discovered Sunday by leaders of the Northlake Church of Christ after the church bought the vacant building in a tax sale. Lake County Coroner David Pastrick and his staff found one body in a bag on a table, another in a burial box and two in caskets. The identities of the bodies have not been determined. Pastrick did not return a message seeking comment left by The Associated Press. Cammack said he let another funeral director use the facility after the state revoked his business license in 2006. He said he doesn't believe the bodies were left from when he ran the funeral home. The state board that regulates funeral homes said it had no record of anyone running Serenity Gardens after Cammack's license was revoked. Tracy Hicks, director of the state Board of Funeral and Cemetery, said Indiana law requires notification if a funeral home is sold or if a new director takes over an existing facility. Cammack's license was revoked after the state received at least six complaints alleging forged signatures, failure to deliver death certificates and delayed delivery of cremated remains by more than a year. Cammack said the complaints were the results of misunderstandings. He said he lost his license after he did not fulfill some state requirements because of health problems. He had previously lost his license in Illinois in 2003 for failing to file a death certificate promptly. Cammack said the problems there stemmed from the death of his father and the loss of paperwork when he moved his business from Illinois to Indiana. Maggie Bey, who filed a complaint accusing Cammack of inflating her brother's funeral cost and forging her signature, said she never saw anyone but Cammack operating Serenity Gardens. The Gary resident lives less than half a mile from the home. "I saw him come in and out a couple of times, but as far as somebody doing business, no. That's not true," she said. Cammack said he was confident the matter would be resolved quickly.